2014 Ten Towering Artists....save the date! April 25-26 !! We are ten artists banding together to create an exhibition of unique fine art and craft in the University Club Tower in Tulsa, Oklahoma. 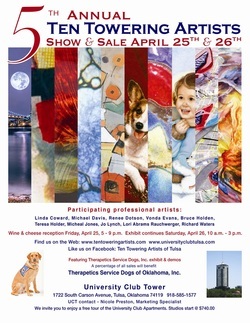 A percentage of all sales from this exhibit will be donated to THERAPETICS, a 501(c)3 organization that breeds, trains and places service dogs to assist Oklahomans with physical disabilities.